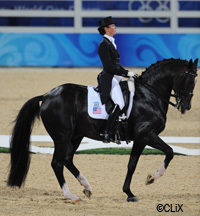 Following a routine drug test on August 19 at the 2008 Olympic Games in Hong Kong, Mythilus, a U.S. dressage horse, ridden by Courtney King-Dye, was found to have tested positive for Felbinac. Felbinac is considered a class A prohibited substance by the Federation Equestre Internationale (FEI). The FEI is the governing body for international equestrian sport worldwide. Felbinac is usually applied topically for the relief of local pain and inflammation and belongs to a group of medicines called non-steroidal anti-inflammatory drugs (NSAIDs). When Mythilus arrived in Hong Kong he was treated in the Hong Kong Jockey Club Clinic for atrial fibrillation as a result of the stress of his trip. U.S. Equestrian Federation (USEF) Veterinarian Dr. Rick Mitchell attended to the horse in close cooperation with the Veterinary Commission. King-Dye and Dr. Mitchell believe that during treatment at the clinic, he may have come in contact with Felbinac. In discussion with King-Dye, USEF vets, grooms and physical therapists, no other explanation or conclusion could be drawn. The USEF is the governing body for U.S. equestrian sport. King-Dye, who placed 13th individually in the dressage competition, was officially notified on the morning of August 22 of the positive test result and the decision for provisional suspension was upheld that evening at a preliminary hearing before one member of the FEI Tribunal. Given that the dressage events of the 2008 Olympic Games ended on August 19, it was decided to wait until the confirmatory B analysis prior to any public announcement of the findings. The FEI has now received confirmation of the initial finding from the analysis of the B sample. Now that the B samples have confirmed all the initial findings, the process will follow the Accelerated Medication Control Procedure during and after the 2008 Olympic Games, which is part of the FEI Regulations for Equestrian events at the 2008 Olympic Games. Norway’s Camiro ridden by Tony Andre Hansen; Ireland’s Lantinus, ridden by Dennis Lynch; Brazil’s Chupa Chup, ridden by Bernardo Alves; and Germany’s Coster, ridden by Christian Ahlmann. All four horse-and-rider combinations were eliminated from the Olympic Individual show jumping competition as a result of the drug test findings. Camiro was part of Norway’s Team bronze medal effort in show jumping. If after further review Norway is disqualified, then there may be a medals’ redistribution, with bronze possibly being handed over to fourth-place finishers Team Switzerland. The next step in these cases is that evidence and written submissions have been requested from each rider, and a three-member panel of the FEI Tribunal has been appointed. Hearings will be held September 5-7 in Lausanne, Switzerland, however it is up to the “person responsible” whether or not they wish to exercise or waive their right to be heard. The panel will then, in light of all the evidence received, make a decision as to the applicable sanction if any. An update will be provided by the FEI following the hearings (September 8) and final decisions will be announced prior to the end of the first week in October, provided the hearings can be held as scheduled. The Olympic competition results will be amended as indicated in the Tribunal’s final decision. Because the King-Dye case is still pending, the USEF has stated it will make no further comment regarding the case. This is absolutely awful! If the drug intake was purposful, they have shamed the U.S. The horse may have hurt its joints, ligaments, or bones, and because it could not feel the pain of the injury. Drugging horses, on purpose or not, must stop! This is terrible situation. Doping is an unconscionable act and the fact that it can be done by someone else to one’s horse just makes it more difficult to enforce against. And mistakes happen too. Who can really tell? i believe that countney would never do such a thing and that this is such an unfortunate and terrible situation. she is such an honest girl and would never drug her horses it is always sad when the horses test positive but i truly believe that she had no idea about any of it. i wish there was a way to know for sure who is innocent so we could save the teams from elimination.